Dean Kremer spent this past Summer like many other college students, traveling and meeting new people. But unlike his peers, Kremer returned home with an award: Best Pitcher in the European Pool C Championships in Ljubljana, Slovenia. Playing for tourney champ Israel, the 18-year-old Californian started two games and went 2-0 with a 0.00 ERA. He gave up just six hits over 13 innings and recorded 20 strikeouts while yielding just one walk. Teammate Simon Rosenbaum was named MVP (see interview). 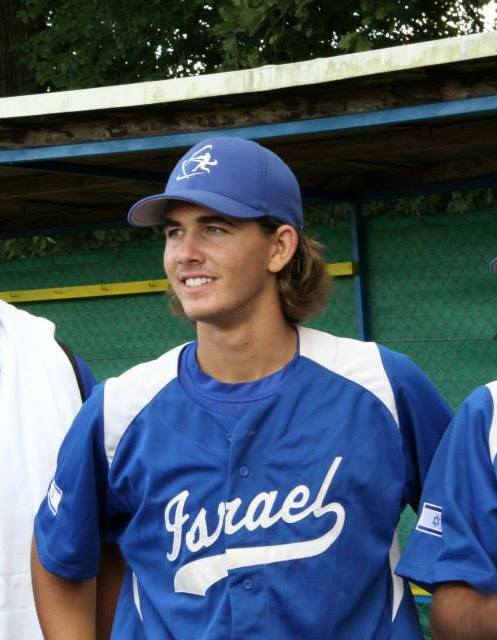 Entering his sophomore year at San Joaquin Delta College, a junior college with a highly touted and successful baseball team, Kremer — who stands 6’2″ tall and is fluent in Hebrew — recently talked with Jewish Baseball News about the tournament and his family’s deep connection to Israel. Following is an edited version. JBN: Tell me about your upbringing. Kremer: I grew up in Stockton, California, and still live there with my parents and two younger brothers. Currently, I am currently attending San Joaquin Delta College. Both of my parents [Adi and Sigal] are Israeli. After completing their army service in Israel, they came together to the U.S. and settled in Stockton. JBN: When did you start playing baseball? Kremer: When I was little, my parents signed me up for every sport – tennis, baseball, soccer, and basketball. As I got older, I concentrated more on soccer and baseball, and eventually decided to devote my efforts to baseball. Through high school, I was an outfielder, but now I am focused on pitching. JBN: Is your family observant? Kremer: We celebrate all of the holidays. Growing up, we would have Shabbat dinner as often as possible. I never attended Hebrew school formally, but since my parents are Israeli, I have been speaking Hebrew my entire life. My family still speaks Hebrew at home. JBN: Do you play games on the High Holidays? Kremer: I don’t think I have ever had a game on Rosh Hashanah or Yom Kippur. But I remember that my parents would pull me out of practice early to be home on the holidays when I was younger. JBN: How did you end up playing for Team Israel? Kremer: In 2011, I learned that the Israeli national team was coached by Pat Doyle, who is also from Stockton. Pat told me to check it out and I went to a few practices. In the Summer of 2013, I played on the U.S. team at the Maccabiah Games in Israel. They saw me play there, and invited me to join Team Israel for the 2014 European Championships. I went to Israel for two months before the tournament to practice with the other members of the team who were there. JBN: Have you visited Israel before? Kremer: I basically have traveled to Israel every summer, to visit family there. I had my Bar Mitzvah in Israel too. My trip to Israel this past summer lasted for two months. It was the longest time I have spent there. JBN: How was the tournament? Kremer: It was a great learning experience. Everyone was hyped up to represent their different countries, which was a cool thing about playing international ball. I think baseball is still getting more popular in Israel. While I was there for the summer, I spent a lot of time working with schools and camps to promote the game. JBN: What’s next for you in your baseball career? Kremer: Delta College is a highly-ranked baseball team, so I am hoping to have a good season and then transfer to a Division I school. Next Summer, I plan to play for Israel again in the next round of the European championships. My ultimate goal is to be drafted by a Major League team. Right now, I am focused on pitching. I have four pitches – fastball, curve, splitter and changeup – and a I think my chances are pretty good. JBN: What baseball players do you admire? Kremer: My favorite team is the Red Sox. I also like Max Scherzer and Jered Weaver. And I follow the Jewish pitchers, like Craig Breslow and Scott Feldman. JBN: Do you see yourself as a role model for Jewish kids? Kremer: I’m not sure I would say that. I think I am more of the type of guy that flies under the radar. I prefer to do my work quietly. Stuart M. Katz is a die-hard Yankees fan. An attorney at Cohen and Wolf in Bridgeport, Conn., he chairs the firm’s Litigation Group, practicing mainly employment law, and represents employers as well as executives.